The T-36C is a rough, easy to use, accurate avionics test equipment for fast testing of avionics equipment such low-mid-high-VHF AM/FM COMM and VOR, LOC, GS, MB. 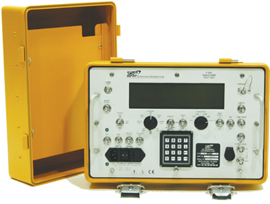 This test set can be used in either keyboard mode (giving complete function testing and diagnostics) or the knob/switch mode (giving the operator who is wearing protective clothing with precise go-no-go testing on the flight line). Additional flexibility is given by the test sets capability to store 3 pre-selected carrier frequencies and output power levels for each operational mode. The keyboard of T-36C gives total control of most parameters which ensures a high level of unit flexibility.